Initially driven by the consumer market, file sync & share solutions have been widely adopted over the last several years. Solutions like DropBox and Box have been continually enhancing their products to become enterprise grade. Microsoft is no exception with OneDrive. OneDrive has been a part of the Microsoft Office 365 suite for some time now and it’s gone through quite a few changes, most, if not all, have been for the better. That’s particularly true of the announcements Microsoft made on May 16, 2017 at their SharePoint Virtual Summit. The barriers for wide scale adoption by enterprise IT for OneDrive have centered around concerns of sync client reliability, administrative control over end users, and security of documents. Additionally, OneDrive had to prove that it really would drive collaboration and productivity through small group sharing and ubiquitous access as compared to network file shares of competitive solutions such as DropBox, Box, etc. The sync client has improved dramatically, administrative control from reporting activity to configuration and security is full featured and easy to use, and now with the latest improvements it’s hard to argue that it wouldn’t significantly enhance productivity, collaboration, and ease of access for end users. The two largest and most impactful changes that Microsoft just released at their SharePoint Virtual Summit is the new “Files-On-Demand” feature and the ability to control sharing of documents direct from File Explorer or Finder (Mac). Files-On-Demand will allow users to interact with their documents stored in Office 365 without having to download them and store on disk. Essentially think of it like Spotify, Netflix, or other streaming services that are introducing this type of feature. Here’s how it works. By way of example, lets look at a common use of a streaming service. Typically I am connected to the Internet when I watch a show on Netflix or stream a song on Spotify – and as such I no longer need to take up space on my phone by putting MP3 files on it or downloading a movie/show from iTunes. However, there are times when I’m traveling or in an area with bad cell reception that it’s handy to have these files available offline. Files-On-Demand is essentially that -- a way to control which OneDrive files will be available to you offline and which can be left for online use only. The obvious benefit is for users who have limited drive space on their device or have a lot of legacy data that is not accessed that frequently and therefore does not need to be readily available. In addition to users loving this feature, it also benefits IT admins. Today, when someone syncs a SharePoint Online team site or OneDrive library, files are re-downloaded on all synced devices when anyone makes a change. Files On-Demand will reduce network bandwidth by eliminating the need to continuously sync shared files on every synced device as teams or groups collaborate. The second feature, and arguably the one with the greatest impact, provides the ability to share direct from the File Explorer in Windows or the Finder in Mac. 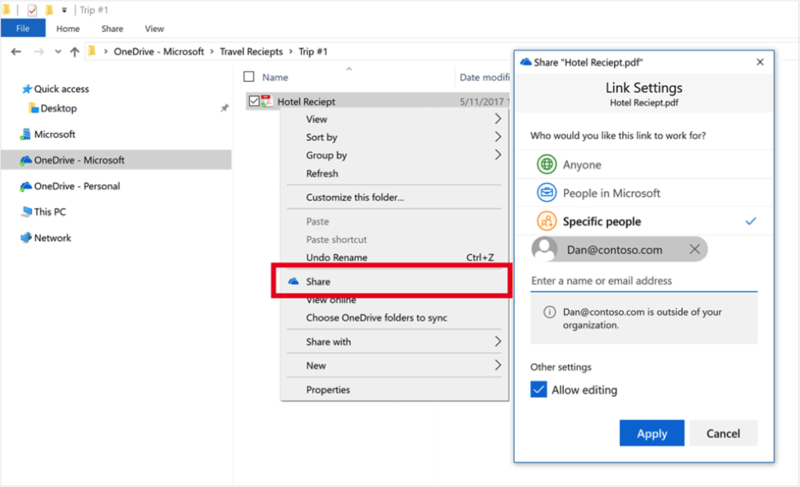 Up to this point, if a user wanted to share a OneDrive document with a colleague or external party it would have to be done through the OneDrive portal. Now, it can be accomplished easily right through the native file explorers. In addition, users can now control how long a link is active and edit those permissions through File Explorer or Finder. See the image below for a preview of the new feature. Files-On-Demand will be released as part of the Windows 10 Fall Creators update and the additional sharing capabilities will be rolled out to most tenants in the next couple of months. We think these enhancements will win over even the biggest OneDrive skeptics, especially those who already own Office 365 or are using Exchange Online currently. Think you might be ready for OneDrive? Daymark has extensive experience working with the Office 365 suite. As a Microsoft Gold Cloud Platform Partner, we help our clients deploy a wide range of cloud solutions to help them get the most of their Microsoft investment. Contact us today at info@daymarksi.com if you’d like to learn more.